Spirit Airlines is one of those low-cost carriers that imposes strict baggage fees that are unavoidable unless you get on the plane with nothing but a purse or camera bag. Its rules are enforced to the letter, and initial cheap airfare quotes quickly grow when the final tab comes into view. There is truth in this perception. 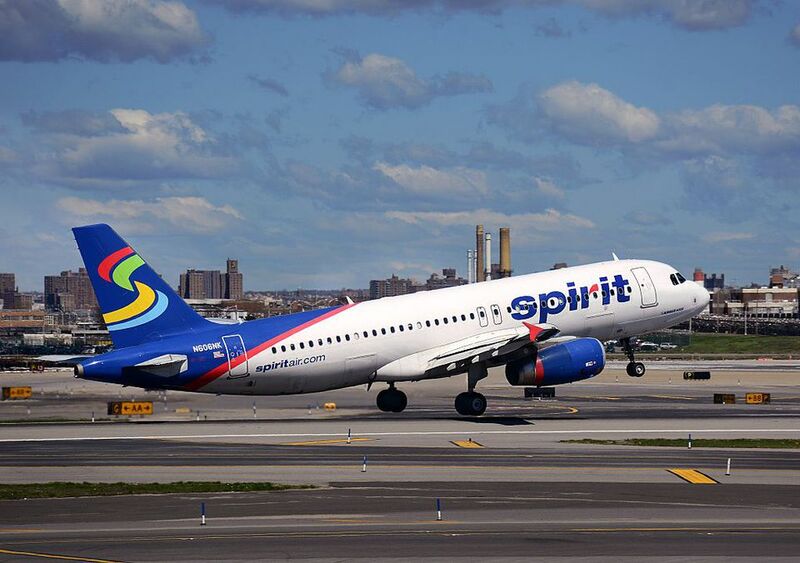 But as with most low-cost carriers, Spirit is misunderstood by a large group of budget travelers who make the false assumption that low-cost carriers are the same as traditional airlines—just cheaper. It pays to familiarize yourself with Spirit's approach to air travel before you make non-refundable bookings with the airline. And if you do, you can fly Spirit cheaply but watch out for those unexpected costs. While Spirit Airlines is transparent about the fees, you really do need to read through their website to inform yourself so you don't end up discovering a fee after its too late. And, you might consider joining their "$9 Fare Club." As the home of the "Bare Fare," Spirit's low ticket prices may save you an "average of 30 percent more than other airlines," per their website. Boarding Pass Fee: Travelers hate this. If you print your boarding pass at the airport it costs $1. If you have the agent print it when you check in, It's $10. Seat Choice: Seating is tight on Spirit Airlines and most seats don't recline. Even choosing between the "tight seats" will cost you extra. Don't expect to be seated with your friends and family. Emergency exit seats cost $10 extra. And if you want to emulate classy flying, Spirit offers “Big Front” seats that are larger than ordinary seats and recline for an extra fee from $20 - $50 depending on the flight. An onboard upgrade will set you back $25 to $175. Food and Water: Bring your credit card if you want a bottle of water on Spirit and there are no free cups of water and ice. Spirit carries inflight refreshments. Bottled water and soft drinks cost between $2 and $3. Beer, wine, and spirits run between $7- $8. Simple snacks like chips or cheese and crackers can cost up to $10 and "meals," can set you back up to $20. Zone 2 Boarding: If you want to board with Zone 2 priority boarding that may run you $5.99 per one-way ticket. Changing Anything: You'll be charged to change your flight. Even if you bought a "Flex Flight" ticket (about $40 more) you can only modify your flight once without an extra charge. Otherwise, you'll be charged between $90 and $100 to change your ticket. Wi-fi: There is no Wi-fi (or anything else to help you pass the time) on Spirit at any cost. At Spirit, if you have luggage, there is no avoiding a baggage fee. The low-cost carrier charges for checked bags and even for the use of overhead bins. In fact, carry-on arrangements will cost more than checking your luggage. You are permitted one free carry-on item, but it must fit under the seat in front of you (18 inches x 14 inches x 8 inches maximum size). This would include a larger purse, laptop case, or briefcase. Checked bags range from $30 - $50 when paid for online. If you pay for your bag when you check in at the airport it will be more. If you get down to the gate with your bag and need to check it, the cost can be as high as $100. When checking bags, keep in mind that the cost rises sharply with multiple bags. Spirit Airlines has an online "Bag-o-Tron," where you can calculate what your luggage will cost you on your particular flight. They are very transparent about fees. You can earn baggage fee discounts and access to cheaper fares if you join the airline's "$9 Fare Club." The actual cost is $59.95, and it's one of those auto-renew memberships that will continue to charge your credit card each year until you order it stopped. Renewal price is $69.95. If you fly Spirit frequently, it's probably worth consideration. Rest assured you'll land on Spirit's marketing lists, but if you like emailed airfare deals, this won't be much of a problem. Spirit offers an option called "The Fast Lane" that bundles the costs of a carry-on bag, seat selection, and airport check-in for $63/person. It's not much of a deal so don't choose it. The airport check-in to obtain a boarding pass will cost $10. You can perform this function yourself online at home for nothing. Take any seat they assign you and board when they tell you to. Check only one bag, pay for it online, and keep within the measurements and weight allowance. When you book, you'll be asked to spend $14 per person on Spirit travel insurance. Before you buy, consider if the coverage is written in your favor, or to Spirit's benefit. Many times, it's a good idea to buy insurance independently. Spirit flies to about 60 destinations in the United States, the Caribbean, Central America, and South America. Although Spirit does not serve any Canadian destinations, it offers flights to the New York cities of Plattsburgh (63 miles from Montreal) or Niagara Falls (81 miles from Toronto). Keep in mind that not every Spirit city is served with daily flights. Its major U.S. hubs include Detroit and Fort Lauderdale, with eight other focus cities in Atlantic City, N.J., Atlanta, Chicago, Dallas, Houston, Las Vegas, Los Angeles, and Myrtle Beach, S.C. Spirit serves some attractive vacation spots such as Aruba, Cabo San Lucas, Cancun, Punta Cana, St. Thomas and San Francisco. In a recent review, for Insider, Kim Renfrow told all about flying "The Worst Airline in America." Like any review, she outlined the fees. She went on to mention the small waiting and boarding area, the tight seating and small tray table. She was disappointed in the "Cheese Plate" with its "processed pasteurized cheese foods." She thought the service was fine but felt that with the few extras she purchased, the flight wasn't all that much cheaper than others. On TripAdvisor, Spirit averages 2.5 out of 5 and many of the comments are related to poor service. And, one customer summarized, "keep your expectations low." You will find many negative reviews of Spirit, and no doubt some of them are justified. But many others are the result of travelers who didn't do their homework. All of Spirit's potentially troublesome baggage policies are spelled out clearly on the airline's website. Don't book a Spirit flight if you can't deal with its many rules and its lengthy fee schedule. In fact, you'll probably make mistakes with other low-cost airlines, too. If you can pay attention to the rules and find a low base airfare, Spirit can be extremely helpful in making budget travel plans for some terrific vacation spots. How Does Allegiant Stack up Among Low-Cost Airline Options? Ryanair Vs. easyJet: Which Airline Is Better? Allegiant AIr to End Non-Stop Flights to Hawaii.